Vi Hart has a great video called Doodling in Math Class: Snakes + Graphs. She has others, too. Some people are watching her stuff and enjoying math for the first time. Something about the hyperactive, slightly cynical delivery combined with pictures drawn in real-time reaches certain folks who are completely immune to the charms of Martin Gardner. Van Wijk says someone asked him to draw some pictures of Seifert surfaces, and “things got totally out of hand”. 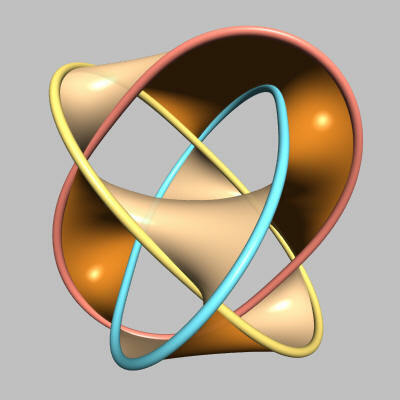 If you let the math of alternating knots and Seifert surfaces get out of hand, before you know it you may find yourself studying the Tait conjectures or instanton Floer homology. The subject is so addictive that even Seifert’s pet border colllie got involved: when shown a knot it would either bark or not bark, following some mysterious rule — and thus the Arf invariant was born. Insane in a good way, I think. Sort of like “teenage Catsters on speed”. I had to watch it about three times. Quiz question: why does the picture of the “shoop” look the way it does? Well, it was a little fast for my taste. :-) It reminds me of the warp speed tempo in which elite high school debating competitions are conducted, in what is called debate spreading (and I shouldn’t be surprised if Vi Hart were trained in that). Unlike Charlie C, I don’t look forward to the day when this style of teaching becomes commonplace. I guess I’m getting old then. uuu…whatever the solution to the obvious problems of communication via a natural language or mathematics may be, simply talking faster won’t be it. But, as I was told by a psychologists specializing in the topic, talking fast and expecting an equally fast answer is a characteristic of people who are usually called “intellectually gifted”. (The second main character is the explorer Alexander von Humboldt, his brother was a secretary of education, if anyone knows about a Humboldt university or school, that’s not him, but his brother). Tim, the “uuu…” makes me think you are disagreeing with something that I wrote, but I cannot figure out what it is. I agree with you that speaking faster is not the answer (particularly if video is not around and one doesn’t get it the first time). Tim, the “uuu…” makes me think you are disagreeing with something that I wrote, but I cannot figure out what it is. I’m not disagreeing with what you wrote. Gauss’ great trial in life is that everyone else thinks so slowly, which makes virtually any kind of human interaction infuriatingly boring for him. Todd, I don’t expect it will be a common style of teaching so much as the occasional “cup of coffee” to get us inspired in the morning and keep us focused later in the day, and also to initiate the occasional newcomer. (Although Eugenia may think otherwise.) As for getting too old, well, that can’t be it – I’m over 70. All this new technology springing up around us is creating all sorts of new ways to communicate and teach. And people who are growing up in this environment are starting to combine these technologies in new and really effective ways! Ten years from now, I believe there will be common teaching techniques that will allow children to learn math concepts that we labor to teach today. Hard thinking and study will still be required of course, but at least they will be able to see the path to their objective more clearly and they will be excited about the journey. I can hardly wait! I like your optimism, Charlie! Thanks, Todd. I just can’t help noticing that it’s a wondrous universe that we’re part of! I really enjoyed these videos, but I wouldn’t call them “teaching.” I mean, I learned some things from them, but I already understood a lot of the math (and engaged in some of the same doodles during my High School career—especially the stars!). For an audience without any previous familiarity with this sort of stuff, I wouldn’t expect them to really learn much math from these videos (although I would be pleased to be proven wrong), but rather to be inspired to try out the same or similar sorts of doodles themselves, and maybe eventually learn about the underlying math from some other, slower, source (or figure it out themselves). Amazing and inspiring!! That really raises the bar for communicating! Imagine a world in which TV commercials were replaced with video clips like this! I actually learned stuff without trying and better yet, I will never forget it! Thank you! Funnily enough I came across these just this week as well. I absolutely love them, and find her delivery utterly compelling. I love her tone, her attitude, and especially her speed of speaking, along with the sped-up drawing. And the jokes she sprinkles around (without labouring them) exactly appeal to my sense of humour. I also share her distaste for maths lessons. And I wish everyone spoke at this speed. Thanks, Eugenia! It feels like you read my mind (although I dropped a hint to make it easy): I was really curious to know what you thought of Vi Hart. Given the similarity between her videos and the Catsters, but also the vast differences, I felt you’d either love her stuff, or hate it. I’d forgotten about your shared fondness for notebooks. Since nobody has answered my quiz question yet, I’ll do it now. The picture of the ‘shoop’ here, like the picture of the overstuffed boa, is a reference to The Little Prince. In that book the main character asks the pilot to draw a sheep. The pilot tries three times, but each time the little prince rejects it. Finally the pilot draws a box, saying it contains exactly the kind of sheep the little prince is imagining. I’ll say that Vi grew on me a little more with her Infinity Elephants. The plural of “series” inevitably reminds me of conversations with Jim Dolan, who writes “serieses” with a straight face (I hope he doesn’t mind my saying that!). Ah! Thanks for explaining the shoop picture. I think there are a few other jokes I’m missing too - what about the one with the two snakes speaking different languages? I don’t want to spoil the fun for everyone else! Puzzle: Explain the names of the languages spoken by the two snakes in this video. Puzzle: Explain the name of the smallest named elephant in the decreasing series in this video. Eugenia actually wants to know the answers, so don’t just nod smugly if you know: tell her! But you will find it here (look under Supporting Cast). Hello from Vietnam! Hue, to be precise. Yes, I guess “Mr. Tusks” is like the walking pair of tusks. There should be some joke about “walking”, “elephant” and “topos theory” but I’ll let you fill in the details. Oh, and the snake languages. Cnefrygbathr vf n Uneel Cbggre ersrerapr; frr urer vs lbh’er vagrerfgrq. Naq Clguba vf n pbzchgre ynathntr. It should be mentioned that Todd is speaking not Snake but rot13. I’ve just watched her video on Ulams Spiral, and it is FAB. It kinda revives the spirit after staring at a textbook proof. Like her and Eugenia, I’m not keen about maths lessons neither. For me, it works as a piece of contemporary art rather than maths. I just posted one in the same style: Math doodles à la Vi. Vi Hart takes a bold stand in the struggle against pi.